A much later in the day update for you! Air China opened up reservations for their newest Canadian route, Montreal-Beijing! The flight will operate 3 times weekly and being a Star Alliance member provides yet another great option for Aeroplan members in Eastern Canada to get to China as Air China is one of the airlines that you can avoid high carrier surcharges on (See our feature on Avoiding Fuel Surcharges) A the time of writing this however we couldn't find these Air China flights on Aeroplan's booking engine so you may have to call in to Aeroplan to see if they can get seats. Chances are online availability should start showing up within a few days. (Source Airlineroute.net) Be sure to also check out our Air China Phoenix Miles bonus miles page for earning offers if you choose the Phoenix Miles program over Aeroplan. Rocketmiles has a short term first time booking bonus of a minimum 5,000 miles awarded in the Rocketmiles program of your choice. Stays must be booked by May 30th. Find out more here. Doctor of Credit reports that TD Bank has taken over the Nordstrom credit card portfolio in the U.S.. Could this mean there will be a Nordstrom Rewards Credit Card in Canada soon seeing that Nordstrom now has two Canadian locations and more opening up soon? We'll just have to wait and see! Nordstrom runs two programs in the U.S. currently, Nordstrom Rewards which is their credit card based program and Debut Rewards which is a straight up loyalty program that is only available in Texas right now. So if TD decides to launch a credit card here I'm going to wager a guess it will be for Nordstrum Rewards not Nordstrum Debut Rewards. 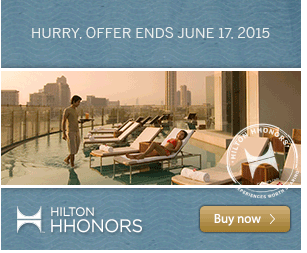 In the bonus offers section check out the 100% bonus on buying Hilton HHonors points. Normally it costs US$10 for every 1,000 points but with the bonus it brings it down to US$5 per 1,000 or 5 cents per point. This is an offer where it can be totally worth it to buy the points for hotel stays as you can you pull out value of 8 cents or more on certain redemptions (check out Loyatly Travelers evaluation here!). - Earn up to 1,000 Bonus HHonors Points when you dine during your stay at the Hilton Istanbul Bomonti Hotel & Conference Center. More... Full Details and online booking Until ? - 1,500 FREE Free Spirit Points for completing a questionnaire. More... Until ?